True story. A close acquaintance of mine had hoped to become the owner of a new minivan last month. Alas, the deal Honda had been offering her, one which would have upgraded her third-gen CR-V to the all-new CR-V with similar terms, was not extendable to the Honda Odyssey. Thing was, she didn’t want a Honda Odyssey. She hated the conspicuous sliding door track, in particular, but found the vehicle as a whole to be ugly. She even went so far as to ask me, “What happened to Honda?” She wanted a new Toyota Sienna. They don’t look so mommyish. And, I reminded her, they come with great commercials. But, her husband reminded her, how does one justify a minimum outlay of $28,120 for a Sienna LE when a Dodge Grand Caravan could be had for $19,995? Even if the Sienna was better, could anyone really say it was worth 41% more money? Thing was, she didn’t want a Grand Caravan. So they didn’t buy anything. All the family which needed squeezing in during the month of August was instead squeezed inside a friend’s minivan. They’ll save their money for a Sienna, more likely than not. Or they’ll listen to me and buy a Good 12-winning Chevrolet Suburban. The real story here is that many, many, many hundreds or even thousands of people were faced with the same minivan-buying conundrum in July. And almost all of them acquired a new Dodge Grand Caravan. They maybe didn’t want to drive the same vehicle as every other mom on the block – it’s the fourth-best-selling vehicle in Canada – and they perhaps wanted a bit more interior refinement. But the Dodge is just so freaking cheap. 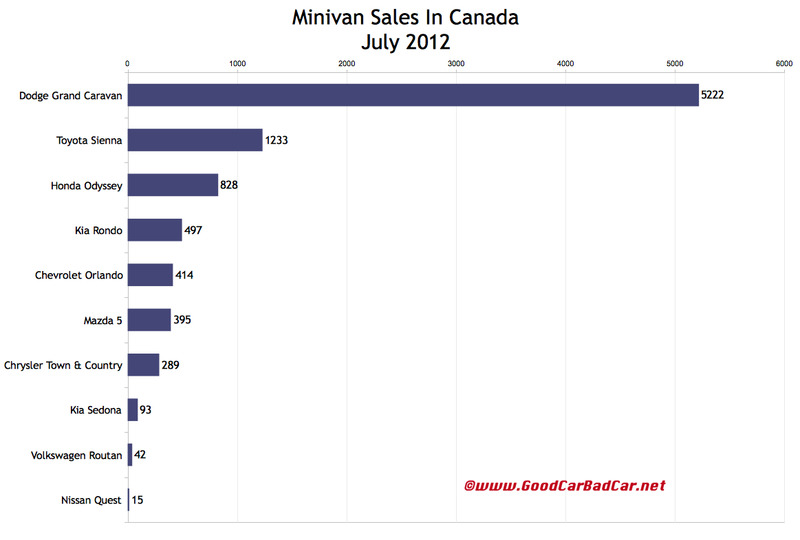 58% of the minivans sold in Canada in July were Grand Caravans. Some were probably more than $19,995. Probably. Canadians faced with a truck-buying decision don’t, in majority fashion, leave a new car dealership in a Ford F-150. 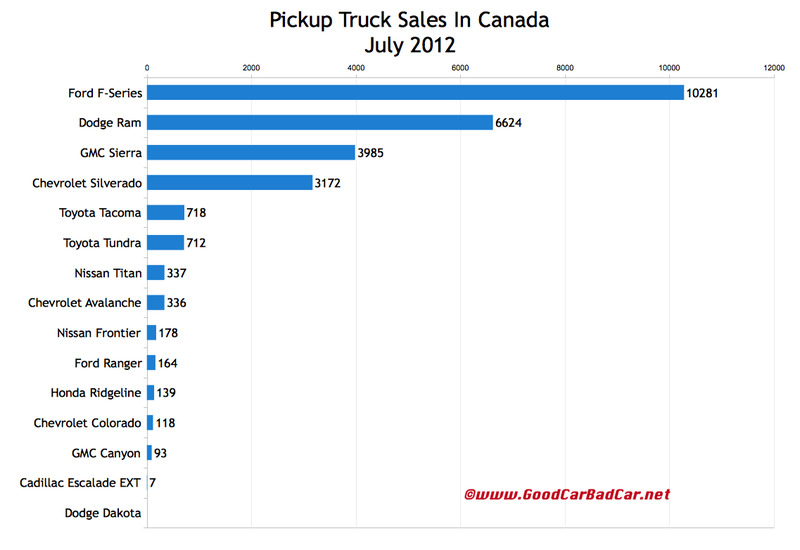 However, no truck ever sells more frequently than the Ford F-Series. 38% of the truck market was F-Series-owned in July. Its closest rival was 3657 sales abaft in July 2012. Combined, GM’s twins were 3124 sales behind. Historical monthly and yearly sales figures for every minivan and truck currently on sale in Canada can be accessed, free of charge, through the first dropdown menu at GCBC’s Sales Stats home. You can click either of the two charts above for a larger view. There are important links to examine at the bottom of this post, after you peruse July 2012 and year-to-date sales figures for ten people carriers and 15 pickups.